Female Smart House Professionals ist ein gefördertes Projekt mit dem Ziel, Frauen für Berufe im Umfeld von SmartHome-Technologien zu qualifizieren. Ziel ist es, einen aktiven Austausch zum Thema Gleichstellung von Frauen in der Wirtschaft anzuregen. Das Projekt wird gefördert im Rahmen der Bundesinitiative "Gleichstellung von Frauen in der Wirtschaft." 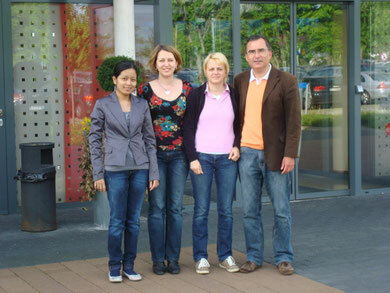 wir haben uns sehr gefreut, Sie im Rahmen unseres Strategieworkshops am 11.5.2012 in Paderborn kennengelernt zu haben. Hello to all, the contents present at this web page are genuinely awesome for people knowledge, well, keep up the good work fellows. Can I just say what a relief to find someone that actually understands what they are talking about online. You definitely realize how to bring an issue to light and make it important. More people ought to look at this and understand this side of the story. I was surprised you're not more popular given that you certainly possess the gift. Aw, this was a really nice post. Spending some time and actual effort to generate a great article� but what can I say� I procrastinate a whole lot and never manage to get anything done. Thank you for any other informative web site. The place else could I am getting that kind of info written in such a perfect approach? I've a challenge that I am just now running on, and I've been on the glance out for such information. It's genuinely very complex in this busy life to listen news on Television, therefore I simply use world wide web for that reason, and obtain the most up-to-date news. I am curious to find out what blog system you are using? I'm experiencing some small security issues with my latest blog and I'd like to find something more risk-free. Do you have any suggestions? My family every time say that I am killing my time here at web, except I know I am getting knowledge every day by reading such good content. Thanks for some other informative blog. The place else may I get that kind of info written in such an ideal manner? I have a challenge that I'm simply now operating on, and I've been at the look out for such info.